Bounce is randomly giving away 3,000 free Bounce bars on their facebook page. Click here to like them and then on the “Dryer Bar Giveaway,” fill out the form to try your luck. Would love to win this! I love bounce but have never tried the bar. Nothing better then a free bounce bar! I lovvvveeee Bounce! I told all my friends about it when the dryer bar first came out. Its awesome! This would be awesome to win and try! i have so much laundry with these kids..
Gotta try this! Better than having to dig dryer sheets out of the clean laundry! This are Awsome,Put them in the Dryer and you never have to rember putting a dryer sheet in and the smell Good! 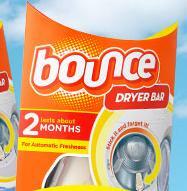 I love the way Bounce smells and would love to try these! Use Bounce but haven’t tried the bar and would love too! I love the smell of bounce!